Cannon has made many different styles of air boxes, so this area has become an important segment of our business. In applications for air handling equipment, Cannon Industries has a unique advantage because most suppliers don’t have the ability to integrate tube forming and sheet metal fabrication. We have found a niche and customer base that needs both capabilities combined in one product. Typically, a sheet metal house will purchase all of their tubing from another supplier, or a tubing company will buy their sheet metal components from another vendor. Cannon can produce all of these products in-house, without additional mark-up, because we can do both operations under one roof. A typical product would be the cover for an alternator used in mining equipment that is exposed to difficult environments. Our solution is effective because often the customer also has a need to run a filter to the alternator, so that coils don’t get jammed up with dirt. Another air box application is in a school bus where it is mounted under the passenger wheel well to filter incoming air, which is especially important in diesel applications. 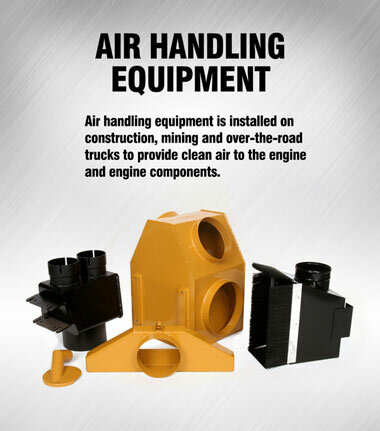 Experience with air handling for heavy construction equipment, mining and industrial applications. We can produce a variety of products required for these applications in-house which helps reduce costs.